This video is an overview and demo of Palo Alto Networks Next-Generation firewall in French. As organizations deploy multiple security solutions to safeguard corporate networks from wide-ranging threats, it becomes increasingly difficult to perform labor-intensive and error-prone tasks such as risk analysis, change management, auditing and compliance checks. Palo Alto Networks and Tufin® have partnered to help customers increase operational efficiency and reduce risk by intelligently automating firewall policy management. Today’s attackers are using exploit kits to automatically find vulnerabilities in common systems. As the use of these attacks increase, so does your chance of being compromised. In order to better protect your organization, you’ll need to understand the inner workings of exploit kits. 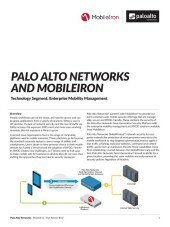 Palo Alto Networks and Solera Networks are combining next generation firewalls with active network forensics to enable security administrators to “see” critical attacks, uncover their root cause and quickly adapt their infrastructure to prevent recurrence and mitigate risk. 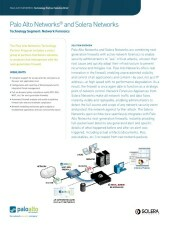 Enterprise Mobility and BYOD trends are causing significant disruption to traditional network security practices. The growth and diversity of mobile device usage combined with the requirement of anytime, anywhere access to applications and data, has presented significant operational challenges and security risk to the IT organization. 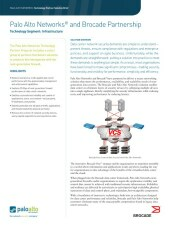 Typical legacy enterprise LAN infrastructures were not architected with adequate management, visibility, and awareness necessary to adapt to today’s application security and mobile provisioning requirements. Join us for this no-cost webinar to get vital details on how the rapidly changing threat landscape may affect your organization. 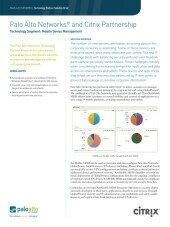 You’ll also get comprehensive strategies for securing your mobile workforce. Verizon and Palo Networks have partnered to offer you the most advanced security technology combined with world-leading managed services. 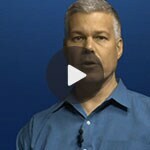 In this video, John Kindervag, Principal Analyst at Forrester Research, defines the "Zero Trust” network architecture, the three key concepts, and the architecture elements that make up a Zero Trust network. The number of smartphones and tablets accessing data on the corporate networks is exploding. Some of these devices are enterprise owned, while many others are user owned. The new IT challenge deals with balancing security with end-user freedom, particularly on personally owned devices. These challenges intensify when considering the increasing demand for application and data access on smartphones and tablets. These devices and apps create new threat vectors that must be addressed by IT executives to prevent data leakage of sensitive corporate information. As organizations deploy multiple security solutions to safeguard corporate networks from a wide range of threats, they are realizing that the traditional manual process of performing risk analysis, change management, auditing and compliance are labor-intensive and error-prone. 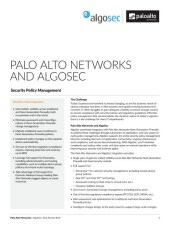 To increase operational efficiency and minimize risk, Palo Alto Networks and AlgoSec have partnered to reduce network security policy complexity by intelligently automating firewall policy management, from optimization to risk analysis to change management. This video is an overview and demo of Palo Alto Networks Next-Generation firewall in Japanese. Hackers and end-users are armed with a variety of technologies that allow them to hide their traffic from traditional network security solutions. 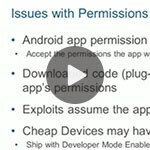 See how the unique capabilities of our App-ID allow you to find and control these applications. Identifying security risks proactively and systematically in a large network is like looking for a needle in a haystack. To address the challenge, it is imperative that the network firewall, as a first line of defense, is optimally configured for security, continuous compliance and high performance. 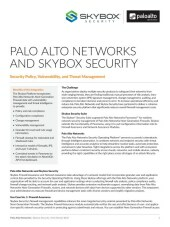 Palo Alto Networks and Skybox® Security have partnered to monitor and prevent security or compliance gaps in an enterprise firewall deployment, and minimize overall firewall management costs. The theft of credit card data continues to grow at an alarming rate. It is costly to credit card companies and merchants, and it undermines consumer confidence. The Payment Card Industry has developed the PCI Data Security Standard (PCI DSS), which includes 12 requirements for protecting cardholder data. 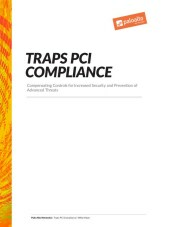 Despite substantial investments made in securing their networks, organizations are realizing that being PCI compliant does not mean an enterprise is protected against advanced cyberattacks. Modern threats are forcing businesses to fully examine the lifecycle of cyberattacks and advanced persistent threats (APTs). During this webcast we review real world data on cyberattacks and dissect the 5 steps of an advanced attack designed to evade security controls. How or why is consumerization happening is almost irrelevant. All that really matters is how to deal with it. Today it's users, rather than IT departments, that are choosing the laptops, smart phones and tablets that they want to use. The resulting challenge for you is not trivial: how to integrate consumer devices in your business, yet still put adequate controls in place to manage the associated risks ­- not the least of which is the risk of exposing your applications and sensitive data to the wrong people. In this live video broadcast, hear Nir Zuk, CTO and co-founder of Palo Alto Networks, and Rich Mogull, Analyst and CEO of Securosis, provide insights and recommendations on how to handle consumerization and the proliferation of devices. Intelligent tablets and smartphones are now the primary personal communications and computing platform for Mobile IT business operations and apps. As a result, IT needs to consider how to provide secure network access to both enterprise and end user owned mobile devices. Moreover, an exponential increase in the number and usage of mobile apps is creating new threat vectors that must be addressed by IT to safeguard mobile devices and prevent data loss. 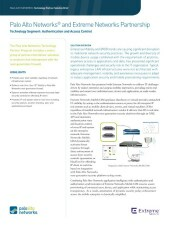 When customers deploy inline appliances on mission critical network segments, they have the option to mitigate the risks of scheduled or unscheduled downtime of an inline appliance for configuration changes, maintenance, or repair scenarios by adding a tap/bypass switch to maintain network continuity. 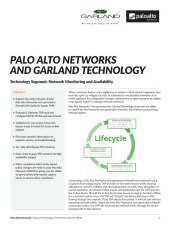 Palo Alto Networks has partnered with Garland Technology to provide the ability to install Palo Alto Networks next-generation firewall inline without compromising network uptime. Las empresas parecen tener una necesidad insaciable de más ancho de banda. Los recientes y sofisticados ataques que utilizan el puerto 80, o el SSL para ocultarse, y se aprovechan de aplicaciones de uso común como el FTP y el RDP para entrar en las redes le están obligando a aumentar sus medidas de seguridad al respecto. This video is an overview and demo of Palo Alto Networks Next-Generation firewall in Portuguese. This video is an overview and demo of Palo Alto Networks Next-Generation firewall in Italian. 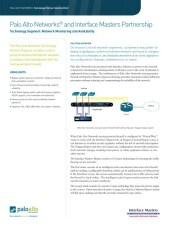 On mission critical network segments, customers may prefer to deploy a tap/bypass switch to maintain network continuity to mitigate the risks of scheduled or unscheduled downtime of an inline appliance for configuration changes, maintenance, or repair. As users become more mobile, you must find new ways to secure your users, who expect to connect and work from any location. 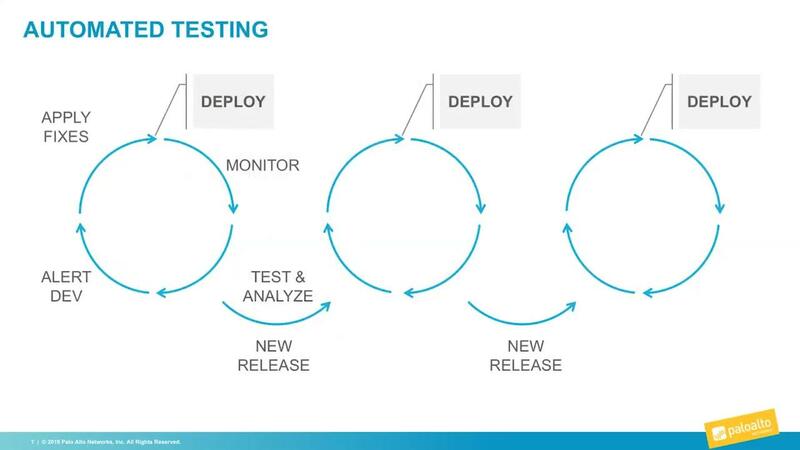 This video shows how you can extend the enterprise security for your users to provide consistent protection regardless of location. Data center network security demands are simple to understand—prevent threats, ensure compliance with regulations and enterprise policies, and support an agile business. Unfortunately, while the demands are straightforward, putting a solution into practice to meet these demands is anything but simple. As a result, most organizations have been forced to make significant compromises—trading security, functionality, and visibility for performance, simplicity, and efficiency. 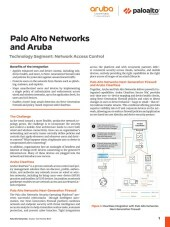 Aruba Networks and Palo Alto Networks have partnered to provide best of class content security for guest and employee owned mobile devices that are now commonplace on enterprise networks. With the certified solution, enterprise IT departments can now securely enable Bring Your Own Device and Guest Access initiatives, while maintaining compliance. Aruba’s Wi-Fi network and Palo Alto Networks’ next-generation firewalls share user, device and application information to monitor and enforce application usage policies on smartphones, tablets and laptops.